Published in the Dover Express, 12 September, 1980. Portions of the masonry were left entire in the walls of the casemates. Some large fragments of the conglomerate material were brought up. and two of the pieces were on view when the installation of the Marquis of Dufferin and Ava took place there in 1892. It is not possible now, without special arrangements to see any part of the Bredenstone. “On the 15th of May, 1213, at an early hour of the morning, John repaired to the Church of the Templars at Dover, and there, surrounded by Bishops, Barons and Knights, took on his knees, before Pandulph, the Pope’s Legate, an oath of fealty to the Pope, at the same time placing in the Envoy's hands a charter testifying that he, the King of England and Lord of Ireland, in atonement for his offences against God and the Church, with the general consent of his Barons, surrendered the Kingship of England and the Lordship of Ireland, which should henceforth be held as fiefs of the Holy See. paying an annual tribute of 700 marks for England, and 300 marks for Ireland. Military science has, from time to time, been employed to fortify the natural strength of the hills of Dover. The principal fortifications of the interior of the Castle are ancient or medieval, and are now practically obsolete. The accommodation for troops both in the old casemates and in modern barracks was for many years in the 19th century used as quarters for No. 1 Depot of the Royal Garrison Artillery and there were usually three companies of the Royal Artillery quartered there. But in 1908 they moved elsewhere. After the Kaiser War Langdon Battery became the headquarters of the Royal Artillery. Facing the sea, in front of the Roman works, a very handsome terrace of officers’ quarters, constructed of Kentish rag. was built in the year 1857; and, in 1891. were added, in the same style, huts for the better housing of the Royal Artillery, who had previously been accommodated in the cliff casemates. 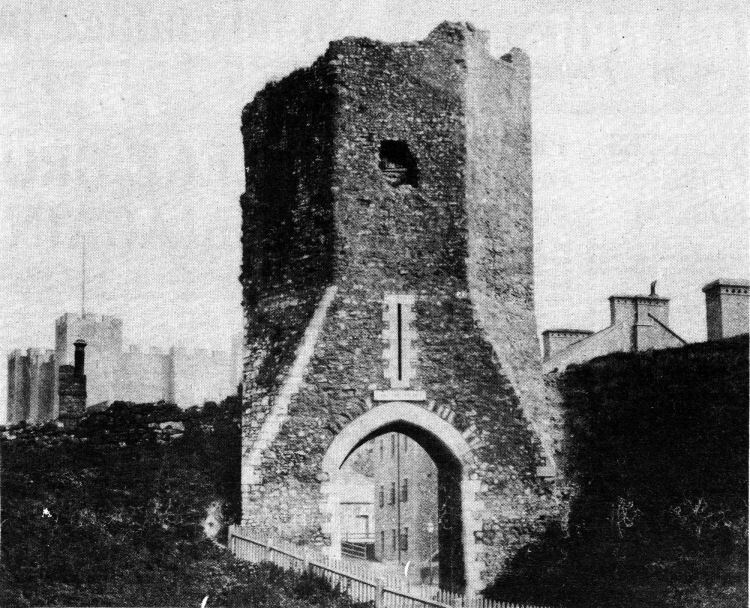 A century old photograph of Colton Tower or Gate, at Dover Castle by the Biggin Street photographer Martin Jacolette who had a studio where the gas showrooms are today. In Saxon times this was the only entrance to the Castle fortifications. The only Saxon tower left standing at the Castle, it is said to have been committed to the care of Fulbert de Dover who appointed an officer to keep guard in It and granted lands at Chilham to provide Income for that purpose. 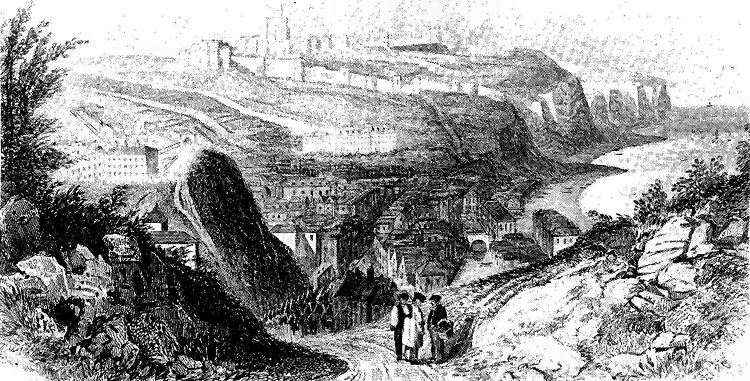 The 19th century engraving below gives a view of Dover from the Western Heights with Grand Shaft Barracks above Snargate Street, on the left. Nearer the foreground is the tower and rooftop of what looks like a church or chapel. Marching down the hill are soldiers from the Citadel barracks.